Wheat & Weeds: What Do You Mean By "Choice"? What Do You Mean By "Choice"? 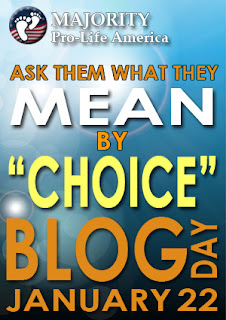 It's NARAL's "blog for choice" day, and therefore a good day to ask 'em what they mean by "choice." Is this the choice they mean, for example? Pro-life demonstrators outside a clinic in Birmingham, AL today watched as not one, but two, ambulances carried out women whose abortions had been botched. The clinic had no emergency access and the women had to be carried out in people's arms. It might surprise most people to know that abortion clinics in most states are not regulated or subject to health inspections in the way any other ambulatory clinic would be -- this in spite of the fact that sepsis, uterine perforation and other life-threatening complications are common. Sound like support for women and profound care for their lives to you? Or maybe this is what they mean? Get a load of how this organization suggests women pay for abortions. Lying, cheating, exploiting your church and friends....not to mention volunteering for medical experiments. Why don't the clinics lower the price -- they're not paying huge overheads for rents in toney neighborhoods or regulation? Why don't "choice" activists demand price controls on the procedure if its for the poor and needy....and not for exploiting them. Or maybe they mean the repeated refusal to report under-age pregnancies, thereby coddling abusers and statutory rapists? Does that seem like protecting the girl's "choice" to you? Or how about the administration's insistence this week that not only are abortifactients legal, but Catholic institutions MUST buy them? Where is the choice in that? This is the choice they mean, and it is the only "choice" permitted, women's options, preferences, well-being and health notwithstanding. Follow the link to watch Eclipse of Reason, the late Dr. Bernard Nathanson's (co-founder of NARAL but later one of the most articulate foes of abortion) film of a typical D&E abortion procedure. (Naturally it is extremely graphic).